A Tottenham Hotspur fan who threw a banana skin at Arsenal’s forward Pierre-Emerick Aubameyang has been banned indefinitely from attending games according to Sky Sports. The incident happened Sunday during the explosive North London derby which Arsenal won 4-2 against Spurs at the Emirates Stadium. The Gabonese danger-man netted twice with Alexandre Lacazette and Lucas Torreira also putting their names on the score-sheet for the big win. Eric Dier and Harry Kane scored Tottenham’ goals. Aubameyang had just fired the Gunners in front from the spot when a banana skin was thrown at him, with a man later arrested. Six other arrests were made for public disorder. 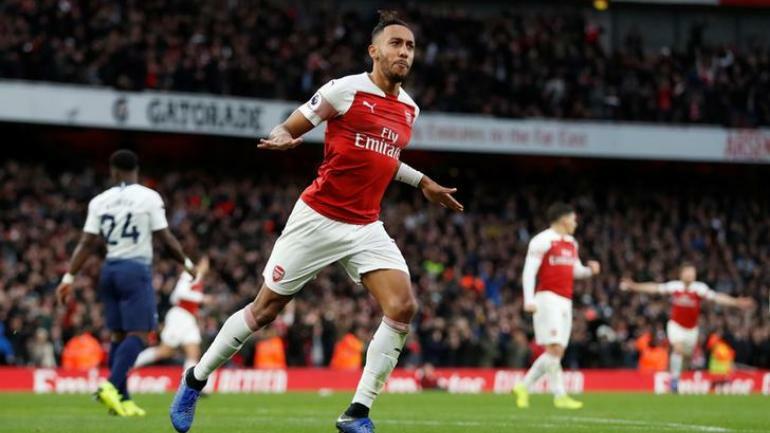 Arsenal extended their unbeaten run to 19 games with the hard-fought win, which helped them leapfrog their bitter rivals in the table.